Wow, big scary drop off in ratings, right? Well, it depends on how you look at it. Surely with that large of a ratings drop in Season 13, they fell out of the top ten, right? Nope. This next graph is a graph of the average RANK by season for performance and results show; meaning, where did the shows place in the top 20. There are so many factors in play for the ratings for this show that it’s extremely difficult to draw any real conclusions. On most TV shows the cast is basically the same every season – not this show. Even the part of the cast that is somewhat static changes a bit every season. The main thing to keep in mind is when reading articles on the show that say “oh, the ratings are down” is that while that might be true on its face, there is a whole bunch of context that they are leaving out. 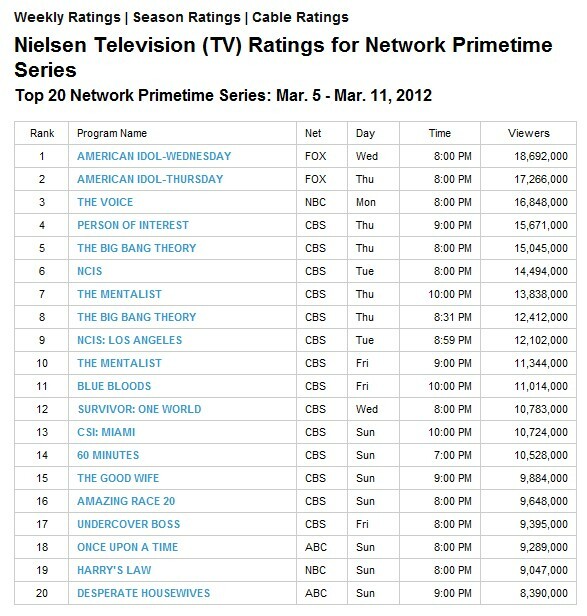 Context like number of viewers, or rank, or how TV as a whole is doing. That’s why, if you care about ratings, it’s important that you look at BOTH numbers, not just one or the other. And not just use a number you don’t understand as a bludgeon to claim that the ratings are down because your favorite pro isn’t on it…or because your idea of a great celeb didn’t make the cut. That’s just silly. 🙂 Anyway, rarely do articles give you any kind of context – they just scream to the heavens that the world is coming to an end. As I said, we’ll look at the ratings week by week and compare them to previous Spring seasons to get a real feel for how the show is doing. 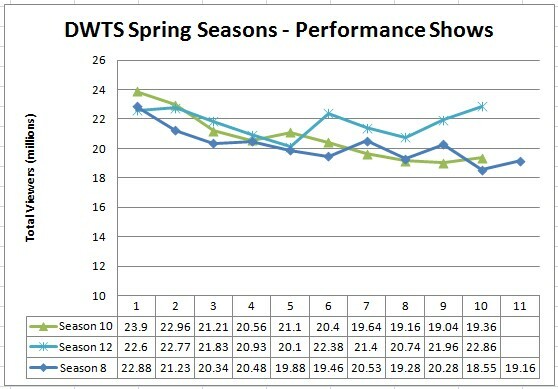 To set the stage, I’ve graphed each week of the performance shows for the Spring seasons and the Fall seasons. Note that, for the most part, the shape of all the Spring seasons are similar to each other as are those for fall – but they aren’t necessarily similar to each other (Season 12 being the exception in that it seems to mimic a fall season in the latter half). I tend to think that the decrease in viewers toward the end of the spring season is due to the improvement in the weather. 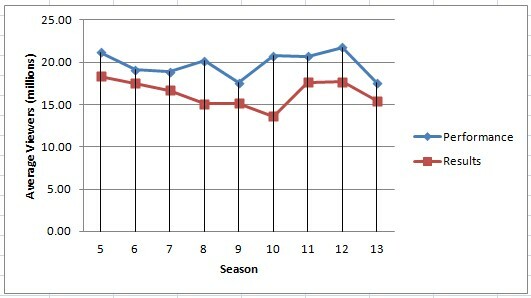 You’ll note that the opposite is true for the fall seasons; the ratings increase toward the end of the season. But I don’t know the reasons (don’t think anyone does), I’m speculating – there are too many variables to draw a lot of conclusions. 28 responses to "Dancing with the Stars – Ratings Watch"
As a numbers geek, I love your analysis. Interesting to note the insight on spring weather making a difference, as people don’t necessarily want to be inside when it’s nice out. it was CRAZY warm all over the country last week – could that be it? Also, to your point of overall viewership down, do you have the numbers of total viewers for the week (or for the top ten shows)? If that trend shows down (or DWTS shows the same percentage of the total), it supports your theory that less people are watching in general. Dwts is fine. The Voice is hurting them more in the key demo but that is one this show never had anyway. The year they did well with the key demo, not surprisingly, was when they had The Situation on which is exactly why they cast him. It is relative, as we can see. With all so many more choices, particularly on cable expectations for what is successful on network tv has to change. Oh Heidi! GOOD JOB! We need to file this post away somewhere so it’c close when we need it for every time someone says ratings are down, etc. I so look forward to this series every week! This show never does well in the targeted demo but total viewers are always high. Idol has been on a downward spiral too for a couple years now. Even if ratings continue to decline it will be a while before its seriously considered for cancellation. Same for Idol. Them jokers at zap2it keep insisting that AI and DWTS will be cancelled soon. I wish the ratings system would change to something more current, no one I know even has a Nielsen’s box. SueB, I am considering calculating the percentage AI is down from a year ago and then looking at the percentage that DWTS is down from a year ago and seeing how close they are – but that seems like it could be a LOT of work, the way I would be compelled to do it. You can’t really do it on a one-time basis because the weekly ratings fluctuate due to a number of factors. That would mean I would have to go back and find the weekly viewership numbers for AI from last season and start tracking it this season. I get tired thinking about that. But I may start tracking AI too and then go back at some point in the future. It’s this type of insightful post that I love about this blog. I do tire of other sights making throwaway remarks based on a lack of understanding about what the numbers really mean. A note about American Idol. I can remember the days when it was consistently pulling over 30 million viewers. If it’s at only 18 mil now? 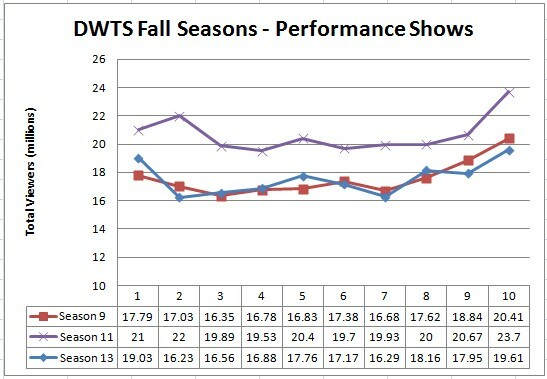 That’s a HUGE drop-off, certainly something much greater than any drop DWTS might be having. For DWTS to basically barge into Monday and take over from a hit which is mid-season (The Voice) and beat them that handly, shows me it’s still got ratings muscle. If that show Duets is a hit, I think dwts can go once a year which I think though a fan would like. Better pool of talent trying to cast once a year than two and gives pros breaks which some need, lol. In the rhinestones and all, even if not a hit in the key demo, this show relatively cheap for abc and they will not be upset at those numbers. Just to note: ABC is repeating Monday’s premiere tonight. I find that interesting. @Melissa: Thats the Kelly Clarkson/Lionel Ritchie one right? If thats the one, i don’t think it will last past 1 season. Too many singing shows already. Saturday is a dead zone for networks now. They have done that before. Nothing interesting about them reairing the premiere. I will be curious if talk of the close race will draw more interest. Vin, you need to read a little closer. This was from two weeks before AI started. Yes with Robin Thicke too. I agree there are too many singing shows but people said that when the voice aired and x factor still drew good ratings in the key demos. Sorry 🙁 Just read the date now. Yeah just saw the tv rating according to ew.com and it’s still equally as depressing and happy (but CSI did pretty damn good this week oddly enough…..maybe it has some life left in it). I loved The Voice when it first aired. But this season, I got bored very quickly and haven’t tuned back in. Great job! I have some down time coming up w/work so if you’d like some help pulling the info + numbers you need for the AI vs DWTS chart lemme know. Interesting how many of you have stopped watching The Voice to view DWTS instead. A lot of my family members have done the same thing. I sent them you tube links of the dances and told them they’d miss out big time this season if they didn’t watch. I can’t believe NCIS is still going strong after all these seasons, I can’t get into it, but my son never misses it. Hey, if you wanna dig up the total viewer numbers for AI for the last few seasons – have at it. 🙂 I got 90% of my info from Zap2It by way of this site. I love the voice, but I gotta say I think the battle rounds could bring the show down. Why on earth do you pair two great singers against each other so that one has to be eliminated?? Seems to me, to get a strong team you would pair a strong singer with one you aren’t sure about. But whatever. I’ll email you what I dig up! @Princess Heidi: I agree about the battle rounds. They kinda bore me. I’ve tended to notice that every judge besides Blake chooses a song that is really only good for one of the singers and is terrible for the other. Saying that, I can never hear “Pumped up kicks” the same way agai nafter Blake’s people butchered it. @Ms. Taz – I hope you were able to find the link. That is where I always rewatch all of the performances. They also have a DWTS link at the top. And for some reason Codebear’s premiere performances seem to be deleted now. So thank goodness I have MJ’s always in my bookmark. Codebear also has accounts on DailyMotion – you can probably find the premiere stuff there. I found both of the sites with no problems and have bookmarked them. Thanks again-it is very much appreciated! Thanks Heidi. I didn’t know that.